The year is almost over! I believe it's less than a week we will welcome two thousand and sixteen at in Gregorian Calendar. As always the end of the year fills with reflections and hope for a better future. Today I would like to reflect on 2015, well mostly on my favorite thing this year. It has been a long year for me full with bad, good and great memories. I acquired lots of stuffs over the year and sometimes it's hard to believe that in less than a year a lot has changed especially in IT world. If I can sum up the year, I would say that this year is all about planner for me. Discovering the other part of memory keeping. Documenting and jotting down things on a planner is memory keeping. As a list maker, of course I have more than one favorite this year, here are what I like in 2015 in no particular order. 1. Audible - ever since that I can buy kindle books, I have been using audible often just because I like switching between reading and listening to books. It really sync beautifully between the two. 2. Apple watch - I bought a rose gold 38mm apple watch from Directd store. I have been wearing this watch every single day ever since I bought it. Wearing any other watch feel a little bit awkward. I really like the design and the color of the watch. 3. iPhone 6s plus - Of course I immediately fall in love with iPhone 6s plus. It's my everything. 4. Kikki K planner- Ever since I got pull into planner / planner decoration world, I have been introduce to filofax, happy planner, midori, hobonici, Carry it, Kikki K, Erin Condren, Color Crush and many more. For 2015, I decided to go with Kikki K and Filofax, so far I'm in love with Kikki K planner. 5. Apple music - Wow! Apple really introduce a lot of new things this year including Apple Music. I used the free three months trial and I love it. I can listen to any music I like anytime anywhere. 6. ebook / kindle - I really have no problem reading an ebook. I have been collecting a lot of books digitally over the years and I have shared what's on my ebook collection this year. I think I read faster on an ebook compare to hardcopy book. I have no idea why. 7. iMac- I bought a new iMac this year. My son inherit my old one. After using iMac for almost two years I can't bring myself to use any other computer. 8. Erin Condren Planner- I have been wanting to try Erin Condren Planner for awhile now but I can't justify buying them in the second quarter of the year. So I have been waiting for them to come out with 2016 edition. When they finally announced their new 2015/2016 planner towards the third quarter of the year, I decided to give this planner a try. I love it. I will be using this planner at home for 2016. 9. Apple TV 2015 - I never thought I would love Apple TV but I do. I love that it has storage and has TV OS. I can have more than one apple id, so I can stream my Apple music right from Apple TV. 10. Hulu - ever since I've subscribe to hulu, I have been watching new tv shows constently there. I also love watching the Mindy Project. I just started watching the show and I am on season two. 11. Polaroid Zip Mobile Printer - the new gadget in the house. I started using this printer a few times since I bought it from erincondren.com. So far I am loving it. It's so portable and easy to use. 12. Adonit Jot Pro stylus - I have been using this stylus a lot this year. I love love it. 13. 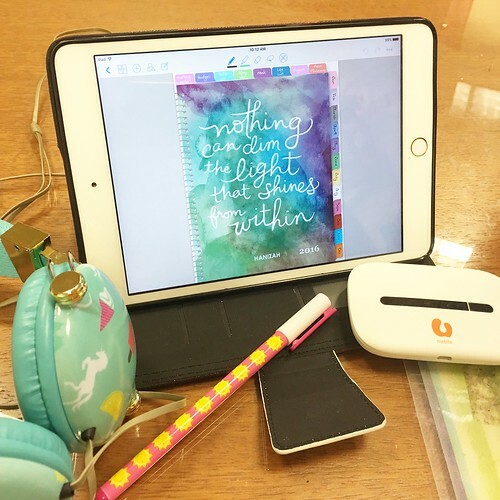 Project Life App - I still in love with Project Life App. Ever since I used this app I can never go back. 14. iPlanner 2015 from digitallyspeaking.net -This is new to me using a digital planner like a filofax and I love love love it. It is the best! 15. Planner Addict Malaysia facebook group - if you are a planner girl and live in Malaysia then this group is for you. It's my favorite group this year. Overall I am happy with my life this year. Life is good, life is great, embrace it. Hope all of you have a great year! !